In June, we will have been in the house for 3 years. Every summer past, I've wished we had a patio set to read at, eat dinner at, grill on, and generally enjoy our awesome deck. This year, the hubby and I decided to finally go for it. 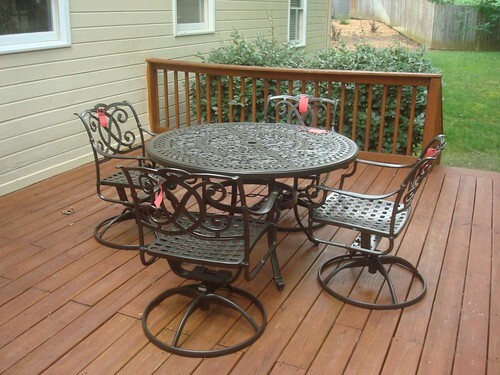 I'm thrilled to have it arrive before Memorial Day (my goal) and tickled pink to have a spot for outdoor living. Between that and our sunroom, I'm all set for sunny places to work on my handwork or lounge with a book. Looks nice! We've just ordered our own this afternoon!